For midsize firms around the world with 100 to 999 employees, advanced technology plays an increasingly important role in business success. Companies have been adding cloud resources to supplement on-premise server, storage, and networking capabilities. At the same time, growth of mobile and remote workers is also changing how companies need to support workers to allow them to be as productive as possible. Like larger companies, midsize firms must make sure that they are effectively coordinating on-premise, public cloud, and private cloud capabilities. Unlike large companies, though, midsize firms are limited in both financial and technical resources to design and coordinate effective solutions to meet specific needs. 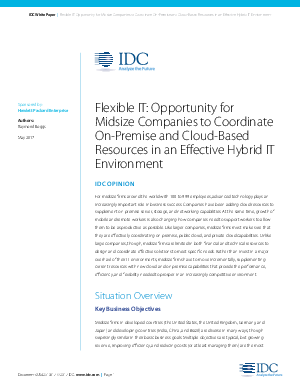 Rather than invest in a major overhaul of their IT environments, midsize firms have to move incrementally, supplementing current resources with new cloud and on-premise capabilities that provide the performance, efficiency, and flexibility needed to prosper in an increasingly competitive environment.